I had quite a brush with the Afghan Whigs back in the early 90s when I had to hold the guitarist up during one song to keep him from falling off the tiny stage at Cicero's in St. Louis. The Cincinnati kids have come a long way, as the band, now reformed, showed recently at the 9:30 Club in DC. When I first saw the Whigs, there were 20 people watching in a sweaty basement, but this show saw a whole new generation packing the renowned club to the rafters and bellowing out many of the Whigs' classic tunes. For me, I was just thrilled that they actually played "Retarded" and "You, My Flower," two songs off my favorite album, their first, Up in It. 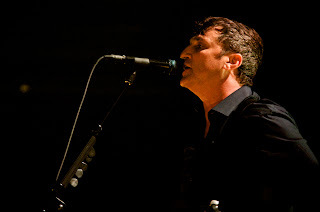 With so much strong material, it is difficult to believe the band only has five albums, perhaps partly because leader Greg Dulli has so much other great material with projects like The Twilight Singers and The Gutter Twins. Even with the Whigs dormant since 1998, Dulli has been notably prolific. 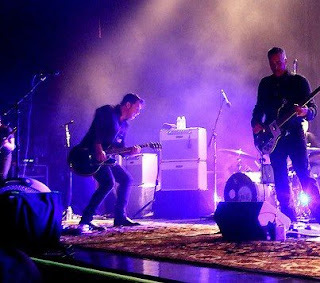 And Dulli, ever the soulful performer pleased the crowd throughout with a journey into the pit, not to mention the band's forays into snippets of songs by Stevie Nicks, Prince, and The Doors. What a pleasure it is to know the Afghan Whigs. This show was ****1/2 out of ***** stars.